Let me just check, should each of the 7 dialogues types have their own identifier? I'd avoid colour, as colours can have different connotations. You could simply identify between a seen and unseen dialogue. For example, a piece of dialogue you haven't seen could be marked with a little red dot. I like the idea of speech bubbles, but I think they'd be more useful to convey body language and emotions--something you can't easily do with the character art itself because the resolution is so low. When playing the game, I'd make a point to listen to everything anyway. I wouldn't want to miss anything, even if it isn't "mandatory". I thought so as well (avoiding colors). I am using right now only two speech bubbles and i think i will stick to them. One with the exclamation mark if there is a dialogue you have not "consumed" yet. One with a question mark if an enemy is about to detect you. I hear you. I think i will also use the exclamation mark for the "lore" dialogues. 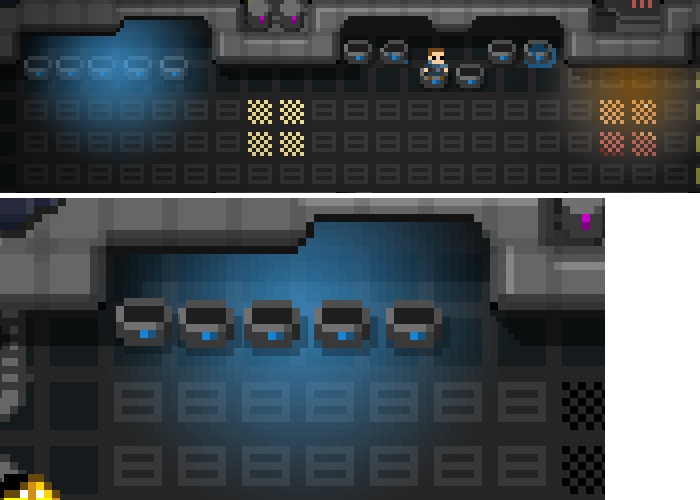 I am currently experimenting a bit with gradient lights to underline the mood in some levels, rather subliminal. It can help for emergency situations and creating moods. Lets see. It's all these little additions that can really improve the player experience. It looks good, but just as a test, try pixelating your gradients to see how it fits with your art style. I tried a "resolution true" gradiant but it did not do much and i simply prefer the one from the example. I want to do some more test though. It will make a bigger difference with a steeper gradient. Personally, I think the pixelated gradient looks better and more consistent with the rest of the art... when it does matter, that is. In your two examples the light is so dim that I can't really tell the difference. (I made a couple mock-ups with GIMP and your screenshots). If you haven't yet, try another test with a small but sharp gradient. I think that'll be the case where your decision makes the strongest impact on the look of the game. It is a very good point yes and i agree that the pixelalted gradient looks nicer (or more consitent as you say). I dont want to open pandoras box here though. A lot of questions seem to pop up. How do i merge multiple gradients with multiple light sources? Should the object be above or below? Below seems to be wrong with sharp gradients. On top is a bit better but the objects still would need illumination as well or it looks weird. Isnt that weird using fixed shadows? I am still undecided if its not too much work. I might just use subtile light gradient (pixelated though) in the worst case. I think the problem with the gradient (pixelated or not) is that neither is correct. For the five "bowls", the bottom half of the image is the front and the top half of the image is the top of the object. A light coming from behind and below the tops would illuminate neither--so you should see just an outline of the light. A light coming from behind and above should illuminate the tops (top half of the image), but not the front (bottom half of the image). Image 1 looks more like an illuminated atmosphere--like shining a point light into a foggy area. Maybe I'm more observant of these things than the typical player would be, because I spent so much time thinking about lighting in my game. It looks neat, but the geometry of the room feels wrong. From a geometry perspective, I think Image 2 looks a lot better. The light source is below the "bowls", so it's a believable scenario. But it's still not correct. The "bowls" should cast a shadow against such a low light. They don't, though. This only makes sense if the "bowls" are floating... but that doesn't make sense either, because the shadows they do have only make sense if they're on the ground. I think fixing Image 1 would be easier than Image 2. Image 1 makes sense if the light source is above the "bowls" (hidden because we can't see the ceiling). The fixed shadows you currently have would work. Different materials have different properties regarding highlights, the colors of light they reflect, etc. You'd need to light each floor tile and object separately--not just apply a single gradient. But it can be done with some animation tricks and wouldn't require intensive calculations. Casting shadows in order to fix Image 2 could require intensive calculations. The fact that I have an isometric projection in my game and you have more of an oblique projection doesn't matter. Both of us are working with 3D worlds, so casting the shadows properly would require you solve a lot of the same problems I did. The math would be a lot easier, though, since your world is completely tile-based, and mine isn't. (It's converted from tiles to walls during the game load phase). That said, it'd still be a lot of work. I don't know how much time you want to spend on it. I am thankful for your answer merrak! I had very similar thoughts and i happy to see that you share this view. My conclusion for now: It is too much work. 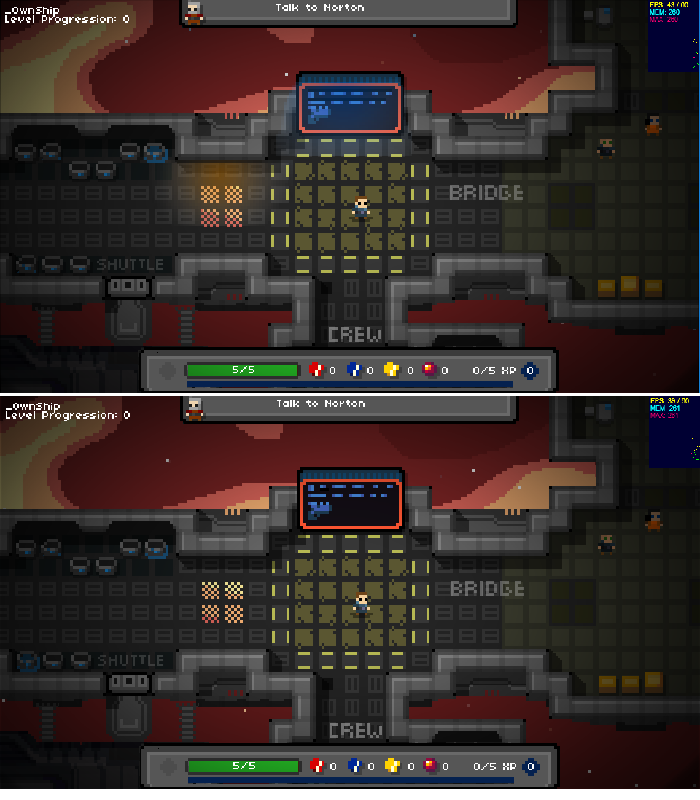 I might use subtile/barely visible glows for alerts and stuff but not try to simulate a proper light system. Maybe in Space Pirates II. I will first finish this game and decide what to do afterwards. I have one more "dream" (similar to a light system; even stronger) which would be fantastic to have for this game but i think this might be too much as well. I would like to have it but its a dream: Voice acting. I love good voice acting and it takes a game on a completely different level. The game has roughly 15400 words (English only). Those are spoken by five main characters (3 men, 2 women) and around 10 side characters. A voice actor can record 1000 words an hour. I need roughly 15 hours. Obviously you can start arguing why you need a studio with engineer etc (my skill in sound recording/radio studio is actually very high) but you need to know that those voice actors wont do home recording etc. I will do some more research on other possibilities but i want a certain quality if i do it. The price above is above my budget though. If I were in the same position, I'd probably make the same call... maybe. It's fun to dream It's always tempting to thinker with things, add new eye candy, and so on, but how much would it add to the game and is it worth pushing the launch date back further or delaying future projects? Or maybe it is worth the time. Would a Kickstarter campaign be a good way to raise some money to hire a voice actor? $4,000 seems modest as far as Kickstarter goes. (I'm not sure about other fund raising sites). Your game already looks very far along in development, so I wouldn't think there'd be as many people concerned they're funding a project that would never get made. You could probably add a static lighting system in about the same time as it'd take to get the voice work done. Dynamic lighting would take a bit more time--or a lot more, depending on how elaborate you want to get. Reg voice: I like that it is a module. I can finish the game and add it on without big "changing" the game. Thats why i could consider collecting the budget and i might do. But first i need to have the text all in to see if it plays out well (pacing, logic etc).